As a teacher, you can instantly reset your students' passwords in the Control Panel. If you see '(default)' in the password column, the password is already the default (the user's first name) and cannot be reset. Users who have a default password will be prompted to change it to something more secure upon logging in. Navigate to the Manage Accounts section of your Control Panel. 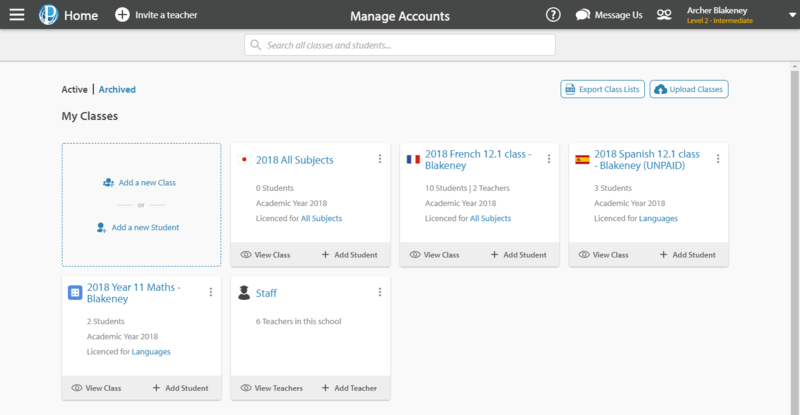 Your classes will be listed on a series of tiles at the top of the page. To open one of your classes, simply click either the name of the class, or the View Class button. You can also scroll down to see a full list of classes or search a student's name in the search bar at the top of the page. Each student whose password isn't the default will have a Reset Password button near their name. Click this and confirm that you want to reset the student's password. If you have any difficulty with these steps, you are more than welcome to email us at support@educationperfect.com with the names of any users that are having trouble logging in and one of our Support staff will be more than happy to get them back into Education Perfect.